15) Can we have item type without process? 16) How to load the workflow from one instance to another instance? 17) What are Synchronous & Asynchronous modes? Synchronous does not interaction with database. 18) Can we have commit inside of the workflow? 19) How to change the workflow process dynamically? 20) How to execute workflow from SRS window? 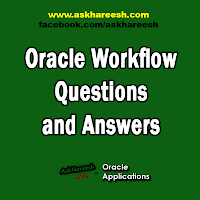 21) What is workflow back ground process purpose? WF_ENGINE.BACKGROUND( ) API to start up a background engine. A lookup type is a static list of values. These lists can be referenced by activities and by item type, message or activity attributes. 23) What is expand roles check box? Check Expand Roles to send an individual copy of the notification message to each user in the role. The notification remains in a user’s notification queue until the user responds or closes the notification. If you do not expand the role for a notification activity, Oracle Workflow sends one copy of the notification message to the assigned performer role and that notification is visible in the notification queue of all the users in that role. If one user in that role responds or closes that notification, the notification is removed from the notification queue of all other users in that role. 25) What are comparison activities? numbers, dates, or text strings. Compare Date :Use to compare the value of an item type attribute of type Date with a constant date. Compare Text : Use to compare the value of two item type attributes of type Text. • Test Value—a constant number, date, or text string which to compare to a reference value. • Reference Value—an item type attribute of type Number, Date, or Text. The comparison activities use the Comparison lookup type for a result code. Possible values are ”Greater Than,” ”Less Than,” ”Equal,” or ”Null,” if the item type attribute is null. compare the elapsed execution time of a process with a constant test time. The Compare Execution Time activity calls a PL/SQL procedure named WF_STANDARD.COMPAREEXECUTIONTIME.